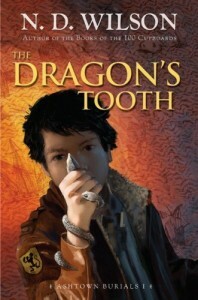 The Dragon’s Tooth, by N. D. Wilson was released about six months ago with much fanfare and excitement. I had enjoyed a couple of Wilson’s other children’s books, Leepike Ridge and The 100 Cupboards, but my disappointment with books 2 and 3 in the 100 Cupboards series made me reluctant to attempt The Dragon’s Tooth. When the fanfare subsided, I pretty much forgot that the book existed. Earlier this month, however, my six-year-old nephew proudly showed it off to me as the longest book he’s ever read. I decided to place it on hold at the library and give it a whirl. Twelve-year-old Cyrus Smith lives in a dilapidated old motel with his older sister Antigone and older brother Dan. With their father dead for several years and their mother in a coma, the Smith children are forced to fend for themselves. For Cyrus, life consists of mundane things like skipping school, collecting old tires, and eating waffles. But when a strange guest named William Skelton checks in at the motel and demands to receive Room 111, life for the Smith children takes a radical change. As the motel goes up in flames around them, Cyrus and Antigone find themselves initiates in a secret society known as the Order of Brendan with a bloodthirsty villain named Maximillien Robespierre on their trail. The children flee to Ashtown, a secret city housing the Order of Brendan, bringing with them a set of magical keys, an invisible snake named Patricia, and a shiny black shard said to be a piece of a dragon’s tooth. The adventure only gets wilder from there with venomous whip spiders, dragonfly surveillance cameras, friendly bull sharks, and immortal enemies. The book is a thrilling page-turner full of allusions to history and literature, a sort of Treasure Island of Dr. Moreau. (And no, I’m not going to explain that. You’ll have to read it see what I mean.) The only disappointment I had after finishing it is that the next book of the series hasn’t yet been published. I can wait. But not very patiently.